Do you know the Root Beer Lady? Well if not, this is your chance to get acquainted. Dorothy's Isle of Pines Root Beer comes from Ely, MN. I stumbled upon this website while researching new root beers to review and ordered a 6 pack of the root beer to be mailed to my house. You can look over the website if you'd like to learn more about Dorothy Molter and her life living in a remote part of Northern Minnesota for the better part of a century. I'll just fill you in on the basics: a nurse by training, she was fond of making root beer for traveling tourists and campers/adventurers. She became such an attraction that she was dubbed "the Root Beer Lady", and now years after her passing her story, estate, and legacy have been turned into a museum and peddled to the masses via this website. You can get an illustrated story book about Dorothy, a video while she was still alive in her later years, her famous root beer, t-shirts, hats, magnets, root beer soap, and even root beer earrings. Honestly, the only thing that interested me was the root beer (one-track mind), but i am sure she was a lovely lady. Feel free to read more about her if you'd like though. The bottles are typical, and the label is loaded with iconic imagery celebrating the life of Dorothy. Her face is plastered on the front and the rest of it is made to look back-woodsy and rugged-frontiery. The background of the label appears to be aspen bark, there is a picture of her cabin around the neck, and the label contains lots of info leading you back to the site that i linked. I had to order a 6 pack because that's the smallest units they sell, and with shipping it ended up being around $25. That's not cheap, but i am finding that most orders i put in for mail order root beer run about that much. I don't like spending that much, but i do it for you, my loyal readers. You're continued support is thanks enough, unless you feel like you want to send me some money to compensate. If so, let me know. Though i give her props for being a root beer expert for several years, the current recipe that is sold via the website is simply nothing special. It reminds of some natural, organic root beers i have reviewed, although i don't think it is. I am sure it's mass produced now with few of the original processes still in place. It's not bad, but i don't really like it that much. I can't put my finger on it, but it tastes like a root beer i have tried before. But basically, it tastes kind of watered down, a touch too sweet, and lacking in carbonation. Plus, it leaves a bad taste in your mouth afterward. This one doesn't really jump out and grab me at all. Like Dorothy herself, this seems weak and frail to me. My official review is that Dorothy's Isle of Pine's Root Beer gets 4 (four) IBCs. My wife isn't a fan at all, which means i have 5 more bottles to drink by myself, and to be honest, i don't think i like it that much either. I might give them away as Christmas gifts or just bring them in to work and leave them in the lunch room like i did with the other hippie natural root beers i didn't want to finish drinking. So in short, if you find yourself in the area where she lived and want to check out her old stomping grounds, then grab a root beer. Otherwise, save your money. I'm smack in the middle of finals right now, and it has not been kind to me. This semester has worn me out, and on top of it all i currently have a cold. It's miserable, but you're not here to listen to me whine, you're here for some root beer news. Well that's just what i have for you today. 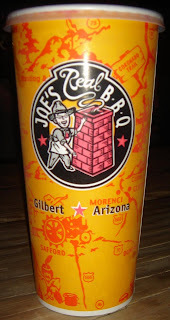 I have lived here in the Mesa/Gilbert/Phoenix area for a good portion of my life and it never occurred to me to review the home made root beer at Joe's Real BBQ in Gilbert until i was there last night for a birthday gathering of a friend of mine (happy birthday Robbie). They have great food at reasonable prices, but more importantly, they have home made root beer. Joe's has been open since 1998, and although it doesn't say it on their site expressly, i am going go ahead and say they have been making their own root beer since their inception. That's the kind of creative power i reserve for my reviews; making up facts. It's probably true anyway, so deal with it. In addition to the root beer beverage, they also tote a root beer cake. My wife was eager to try it, but we were fairly disappointed when we discovered that it's just chocolate cake and doesn't taste like root beer at all. 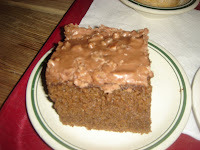 However, it did spark some ideas on making a genuine, delicious root beer cake that myself and a few associates of mine may need to perfect and flood the market with. The picture i have depicting the soda is of a Joe's BBQ paper cup. Not that exciting i know, but it's the best i can do since i don't think they bottle and/or ship it anywhere. So in order to try it you must go down to the establishment itself. That shouldn't be a cause of distress though. As i mentioned before, the food is very good. Anyway, there is a cartoony guy on the orange cup who i will assume is Joe himself. The background is a road map of the great state of Arizona, or as it's known to anyone who lives here, God's country. Home made root beer doesn't hold much appeal for me, and as much as i like Joe's food, his root beer leaves something to be desired. There is plenty of carbonation, so that's not the problem, but the flavor is just not that great. 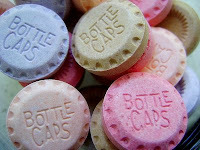 You know those bottle caps candies? The ones that taste like different sodas, like cola, cherry, etc.? Well this root beer basically tastes just like the root beer flavored bottle cap. The weird thing is that i like the root beer flavored bottle cap candy, but it doesn't translate well into an actual beverage. The flavor is very sharp for some reason and ultimately kind of a let down. It's not terrible by any means, but i think Joe should make some revisions to the recipe and come back with something a little more palatable. My official review is that Joe's Real BBQ gets 5 (five) IBCs. That's being generous too. I like Joe's, so i don't want to slam his root beer, but it's really not that great. It's unfortunate. But that doesn't mean you shouldn't try it if you go down there. The rest of the dining experience more than makes up for the little bit that the root beer lacks. Plus, if you go on your birthday, you're meal is free, and that right there is some sweet action.